08/09/2018 - Thanks for supporting small business! 11/19/2014 - Are you dreading the upcoming Christmas rush? While traveling around the world, I travel with a variety of Dashing Digits designs so I can match my style to my nails. I receive many compliments from people around the world. Thanks for supporting small business! 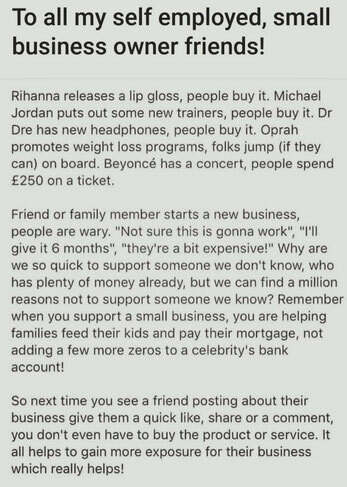 I saw this post online recently and thought it was spot on. Thank you to all of our Dashing Divas (and Dashing Dudes) who help support our small business. This is something we started from the ground-up in hopes of adding a little fun to people's lives. We sincerely appreciate all your likes, feedback, pictures, and orders.